It’s a topic fiercely debated between the traditionalists and the more fashion forwards as to whether polished dress shoes make for appropriate attire teamed with a pair of jean. While fashion does still have its rule book, it’s largely a matter of personal taste and style. Jeans are a go-to staple look for many a casual mandate and they do look incredibly smart paired with a dress shoe and a sports-style blazer. It’s the perfect marriage between classic and contemporary. So yes, you can absolutely wear dress shoes with jeans but as we’ve already established, there are a couple of important considerations, rather than rules as such, by which you should abide. There are no hard and fast rules when it comes to fashion. There are many opinions and recommendations as to what looks better, what is more comfortable and what is more fashionable and socially acceptable. Sometimes you just need a slightly more formal look, without having to pull out the tux and black tie. Jeans are generally thought of as being casual and less formal. However, jeans are becoming a staple in formal wear after being dressed up to formal status. Dress shoes are generally known for being the height of formality. They are the type of shoe you would pair with a suit to a black-tie affair. The question on everyone’s mind now is: “Is it even possible to pair my jeans with dress shoes?” The short answer is “Yes! Of course, you can.” There are, however, a few rules you need to abide by in order to really pull the look off well and not look like you are fashion-challenged. The type, fit. color and form of your jeans is crucial to pulling off this look. The darker the denim the better and also the dressier too. Think smartly casual jeans as opposed to distressed looking ones. You need to invest in the kind that fit and flatter your shape and are a good standard length that sit nicely against the heel of your shoe. Under no circumstances should you ever consider wearing boot cut jeans with your smart shoes. That is just a fashion crime on so many levels. Don’t team your dress shoes with ripped jeans or trendy stone washes either. Keep the denim classic, in a regular straight leg cut and you will look sharp and sophisticated. Colored denims can also look great with a smart dress shoe, especially a dark brown one which provides lots of versatility when it comes to color combinations. You could try a khaki denim for example with a brown brogue. This kind of combination is great for business casual and smart casual occasions, especially worn with a classic white buttoned down dress shirt and an effortlessly stylish blazer. With such a wide variety of jeans available on the market, you need to make sure you have just the right pair to pull the look off. From different colors to different cuts and styles, pick a pair of jeans that don’t look like your run-of-the-mill casual jeans. In other words, find a pair of jeans that look dressier than your average pair of casual jeans. It’s important to remember that you can’t just throw on any old jeans and expect the outfit to work well. Some planning and thought is necessary to make sure you don’t end up committing a fashion faux pas. It’s easy to pick out casual jeans since they are usually the ones that have a lighter wash, are ripped or have holes of any kind or distressed denim. These styles are a great fashion trend, but they scream casual. So, it’s best to avoid them if you are planning on wearing dress shoes. The reason for that is that they make two very different statements when it comes to the style. Casual clothing items are casual for a reason. They are meant to be worn under normal, everyday circumstances and show a more relaxed attitude. Meanwhile, less casual clothing items are meant to display a more serious attitude that is considered to be more acceptable at a formal event or workplace. Dressier jeans are those that fit well around the hips and waist. They are also at a particular length so as to not drag on the ground but are not so short that the tops of your shoes can be seen. Bootleg jeans are not ideal for a more dressed up look. It’s better to opt for jeans that are more tapered at the bottom. When it comes to the cut of your jeans, avoid anything baggy and instead pick a pair that is a regular or slim cut. In terms of color, opt for darker shades of black or indigo. Experiment with different-colored denim and you will find that many colors work well with both dark brown and black dress shoes. If you’re unsure about which kinds of dress jeans will work best for you, then you can always seek out professional help. Putting certain kinds of looks together can be a learning process, so there’s no shame in getting a little help to achieve the right look. The good news is there are multiple styles of dress jeans out there that can help you to get the right style. Skinny jeans are a popular cut for men right now and work incredibly well with dress shoes. Their sleek and fitted look gives you a more streamlined look and works perfectly with a good pair of loafers. While this style may not be ideal for everyone, it can really work when you put it together with the right dress shoes. Like with other kinds of jeans, you’ll also want to avoid holes, worn areas or other more casual features. It can also be a good idea to pair this look with a belt just to ensure you’re getting the best possible fit from the jeans. If you prefer a slim fit style of jeans, you can achieve the same results without squeezing into a pair of skinnies. If you have a more athletic build, then these are the best option for you. Pair the slim fit with a pair of Dr. Martens since they are a little bulkier and create the contrast you need. These can often provide a little more comfort than skinny cut jeans and may be slightly more suitable to work or slightly more formal situations. Generally speaking, it’s a good idea to find a pair of jeans that fit well. The better the fit, the classier the overall look is going to be. Jeans that aren’t quite the ideal fit can really bring down the level of style, even if they are generally considered to be a good dress option. The jeans are only one side of the story, though. Your dress shoes are also extremely important in pulling off the look that combines jeans and dress shoes perfectly. 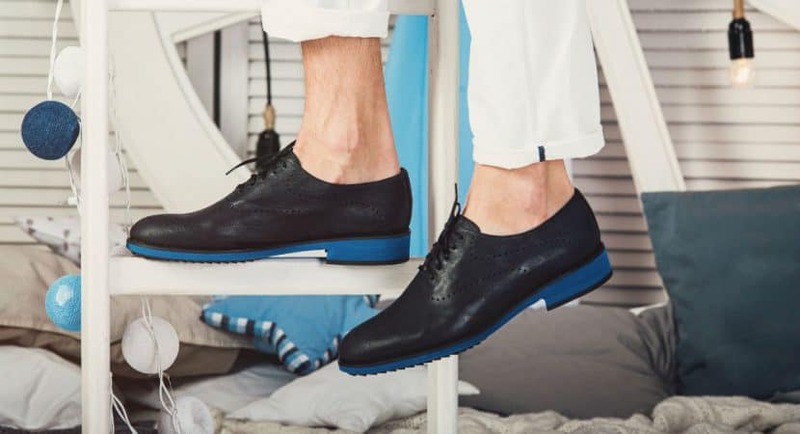 Dress shoes themselves come in various degrees of formality so opt for something that has a bit more of a casual vibe, like a loafer for example or even a Derby dress shoe. Another fantastic option teamed with jeans is a beautiful high quality leather dessert boot. These really do look fabulous with jeans. To meet in the middle ground, it is advised that you pick a pair of dress shoes that are slightly more casual, allowing you to bridge the gap between the casual jeans and the formal dress shoes. It is advised that you avoid the more formal shoes like Oxford shoes as they will not pair well with jeans. Instead, opt for styles such as the Loafer, the Blucher or the Derby. The shapes of these styles lend themselves to a more casual vibe which pairs perfectly with smarter jeans. It is important to remember that there should be a good contrast between your shoes and your jeans and they should not be exactly the same color. A professional can help you with making sure the jeans and shoes you want to go with look decent if you aren’t sure. Otherwise, there are a number of guides online that can help you with picking the right styles, colors and other features for a great-looking outfit. By pairing jeans with dress shoes, you automatically need to rev up the rest of your look. You won’t be able to pull off a simple t-shirt or sweater with dress shoes. Add a well-fitted and collared, button-down shirt or even a dress shirt to elevate the look. It is advised that you keep any other accessories simple, such as a tie or even a cool hat. If you choose to add a few extra accessories, be sure that they match the rest of your look. You don’t want a mismatched bowtie with your well-put-together outfit. Make sure you do some research if you aren’t familiar with putting together more formal outfits. It’s important to make sure that you don’t overdo it or mismatch your shoes, jeans or accessories or it can really put a damper on the look you’re going for. When to Avoid This Look? When larger men wear dress shoes, their feet tend to look a lot smaller, so be careful not to fall into this trap. If you have a larger midsection, it’s better to avoid the dress shoe and jeans combination as it can look quite unbalanced on your figure and make you look a little disproportioned. You’ll also want to make sure that this level of formality is ideal for the event you’re going to or the workplace you’ll be in. Different levels of formality can get somewhat tricky, so it’s wise to make sure you’re matching the expectations of the place. The internet is a wonderful resource for finding the kind of style you’re looking for as well as seeking out guides to pull it off correctly. With a wide variety of shades of blue jeans, the opportunities for a great look are endless. However, it may prove to be difficult with certain shades. Brown dress shoes are a great match for dark blue jeans. Black jeans are the most versatile and can be paired with almost any color of shoe. However, the best option to pair with your black jeans is a matte leather shoe. This will give your jeans a simple yet stylish finish. You need to be cautious with gray jeans. Light gray needs to be kept simple with a similar tone of shoes, while dark gray is more versatile and can be more formal than lighter grays. Dark brown or black dress shoes will pair well with dark gray jeans. When putting together a look that is the perfect combination of casual and formal, remember to keep it simple and match the colors carefully. Combine smarter jeans and more casual dress shoes to achieve this. As a final cautionary note when pulling together a dress show and jeans ensemble, do pay close attention to your top and jacket. Don’t be tempted to go too casual, throwing on any old t-shirt or sweatshirt as this will just drag the whole outfit down and make a mockery out of the fact that you are even wearing dress shoes in the first place. Keep it elegant and elevated by choosing a simple button down crisp shirt either in a plain white which looks really dashing with a blazer, or a more contemporary color to add some pizazz and personality. A nice classic striped shirt or something with a check can also look very stylish with jeans and loafers. The most important thing as ever is to own your style and bring your confidence to the outfit. That way, you are bound to cut a dashing and sophisticated figure in your jeans and dress shoe combination.